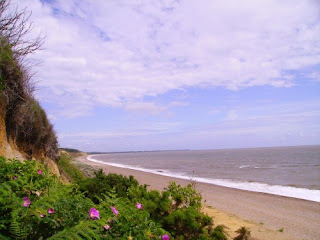 I passed through Dunwich a few years ago, on a trip home from Norwich to London, when time allowed and the scenic, coastal route seemed preferable to the A11. I didn't linger much beyond a bite to eat and a pint of Adnams by the fire at the Ship Inn, as there's not a lot to see here in this sleepy coastal village. However, shortly afterwards, I was amazed to discover that in Medieval times, Dunwich, which has now has a population of around 120, used to be one of Britain's most prosperous towns - in the 14th century, it rivalled London in size. As I looked back on my first trip here, and remembered the rather desolate main street (the only street?!) this seemed frankly laughable. You see, Dunwich of old - the capital of East Anglia, major trading and fishing centre and one time centre of the English wool trade - now lies deep below the North Sea. 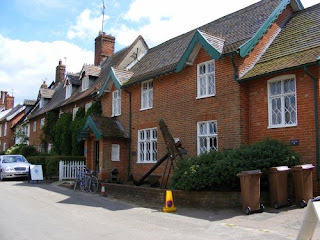 So, this time round, I decided to get to the bottom of this very watery, hidden treasure and the village museum (above), transformed in the 70's from a beautiful old cottage, is a fantastic treasure trove of information. The helpful chap manning the displays tells me that during the 13th and 14th centuries, this part of East Anglia was battered by heavy storms and coastal erosion. In January 1286, a violent storm shook the whole of England for five long days, during which, one million tons of sand and shingle were deposited in Dunwich Harbour. With no mechanical means to remove the debris, this effectively spelled the end for Dunwich and, as the sea continued to erode the soft cliffs away, the town was gradually abandonned. In all, eight churches, two monastries, two hospitals and hundreds of other buildings were lost to the sea. Legend has it that if you stand on the beach and listen carefully, you can still hear the sound of church bells from the lost churches tolling beneath the grey sea. I decided I couldn't leave without putting this to the test. I bought some fish and chips from the Flora Tea Rooms (the stuff of more Dunwich legend) and went and sat on the shingle beach expecting a requiem of underwater bell ringing. However being more foodie than campanologist, I was completely engrossed in my skate and chips, and I can't claim to have heard anything much above the wind whipping around my chip paper. Opening times: Daily 11.30am - 4.30pm, April to October. I'd just like to say what a superb blog you've created here. I found your articles to be very well written and informative. I particularly enjoyed your article about Dunwich. I found it to be very helpful, especially as I'm planning on visiting there myself to research an article for my own blog. I hope to check back here regularly to see how you're progressing with the tour.